with this zoomable and scrollable Flash 5 Map! While in North America the U.S. Dollar is still a legal and offical currency, the British Pound is worldwide to most often used currency. The British Empire and all Commonwealth Nations use it as local currency. Other noteworthy currencies are the French Franc, the German Goldmark and the Yen, last one is a common currency in Asia. Also Gold has become a payment instrument again, and in remote regions bartering is the only way to get tools or food. 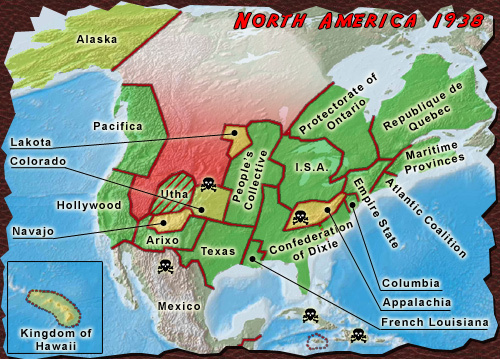 See which nations arose from the ashes of North America.